For all of my ladies who love nail polish, this posting is especially for you! I have something amazingly awesome for you! 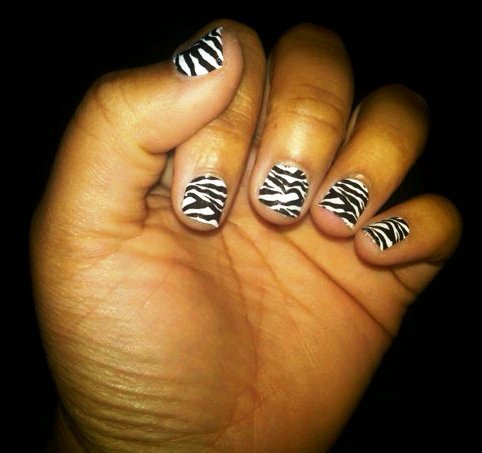 I recently tried Sally Hansen's Salon Effects nail strips and they are AWESOME! If you haven't heard of these strips, they are a pre-cut strips that come in a box including a nail file and cuticle stick. There are 16 strips in the box. You just simply find the pre-cut strip that best fits your nail, peel, and stick. You can simply fold and pull of the excess strip from the nail and then file them down with the included file. They are already dry and ready to go. These strips are very comparable to minx but for only a fraction of the price! This box of strips was $8.50 at Walmart. They are said to last to up to 10 days. Want to see how they are put on? Check out the link below! As always, God bless.